If there’s a Frankenstein’s monster lurking anywhere in today’s automotive world, perhaps it’s the high-performance luxury sport-utility vehicle. Just like the legendary literary doc’s envelope-stretching biology experiment, the high-roller hot rod SUV pulls together the essences of diverse donors in an attempt to breathe life into something that nature may not have intended. 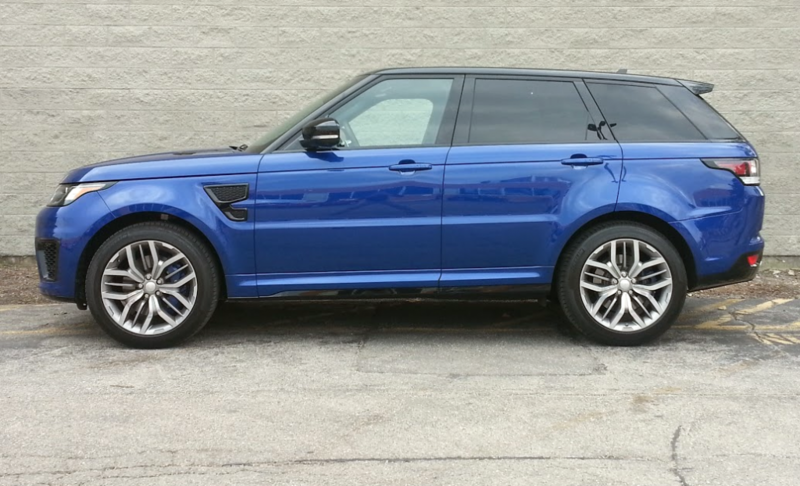 The SVR package adds a whopping $30,480 to the Range Rover Sport’s bottom line. 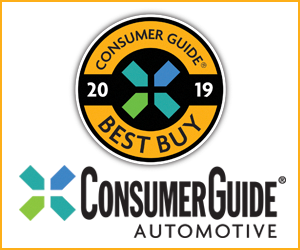 The Range Rover Sport SVR that Consumer Guide® tested newly joins this realm, already populated by the likes of the Mercedes-Benz AMG GLE63 (formerly the ML63 AMG) and BMW X5 M. It features a 550-hp 5.0-liter supercharged V8 that maker Land Rover claims will propel the SVR to 60 mph from a standstill in 4.5 seconds and top out at an electronically limited 162 mph. It’s irrefutably plush, too, and packed with technology features, including devices designed to help meet the challenges of driving off-road. 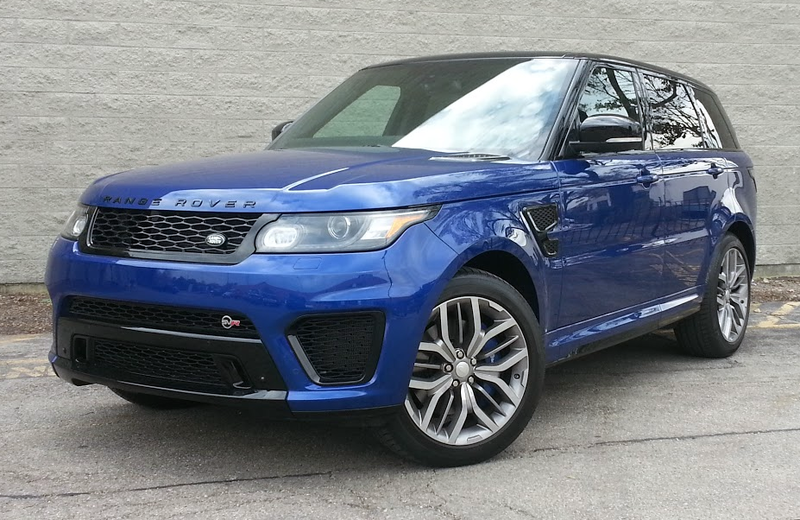 No surprises, then, that the SVR is priced squarely north of $100,000, like the others of its ilk. The Sport’s cabin is both roomy and opulently appointed. The carbon-fiber trim elements are a $2300 option. “HRRRNGHHH!” as Frankie might say. However, can this impressive jack-of-all-trades be master of any? Even with a reliance on aluminum construction, the raciest Range Rover still weighs 5148 pounds, so a classic muscle car it’s not. Rolling stock consists of 275/45R21 all-season tires on great-looking 5-spoke alloy wheels that would cost a pile to replace if scratched on the trail. Stylish, plush stuff abounds inside, making the cabin a living room on wheels. CG’s test truck was particularly striking with lots of almost-white leather that should probably never be introduced to a wet dog or an 8-year-old with an ice-cream cone. What the SVR can do without debate is sound great when prodded into action, thanks to its two-stage active exhaust with electronically controlled valves. Compared to the base Sport V8, the SVR mill uses modified engine management and added supercharger boost to make 40 more horsepower and 41 more lb-ft of torque (502 versus 461). The result is remarkable getaway even in such a high, heavy package. It is paired with a crisp-shifting adaptive 8-speed ZF-built automatic transmission. One sprint the SVR surely will win is the one to the gas pump. EPA fuel-mileage estimates are 14 mpg city/16 mpg combined/19 mpg highway. This tester wasn’t even that “lucky”—his stint of 173.7 miles, with 65 percent city-style driving, showed just 13.37 mpg. By the way, that’s even with the benefit of a fairly smooth stop/start system kicking in at full stops. The fully independent SVR chassis, itself composed mainly of aluminum pieces, has double wishbones in front and a multiple-link layout at the back. Four-corner air suspension and continuously variable dampers deliver a well-balanced ride and handling mix—again taking into account the basic nature of the vehicle. Electric power steering and big ventilated Brembo disc brakes (15-inch rotors in front) do a fine job of handling the turning and stopping. 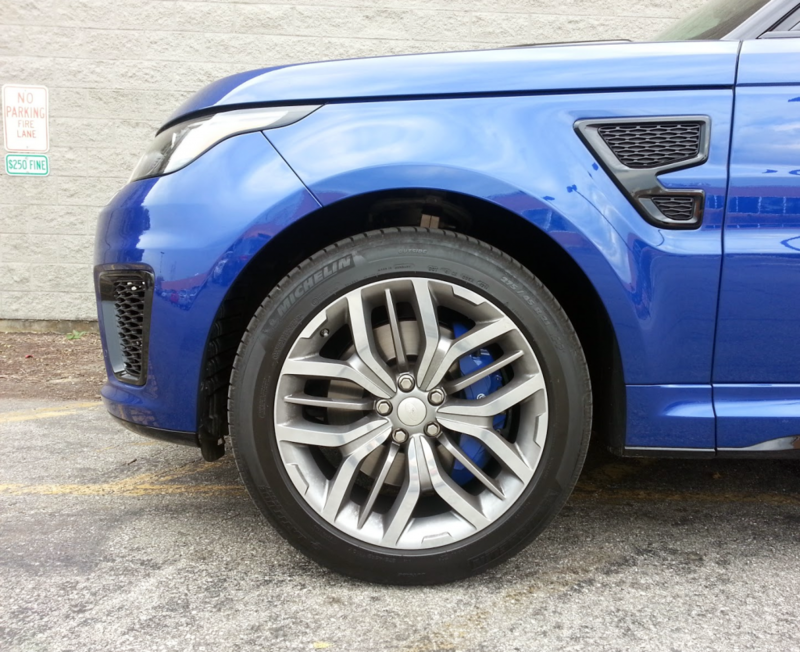 Peeking through the spokes of the SVR’s 20-inch wheels are blue Brembo-brand brake calipers. 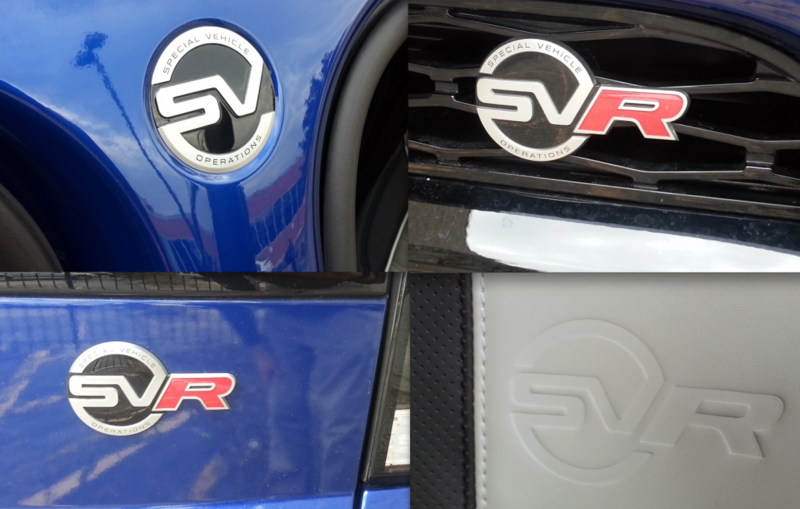 Meanwhile, the SVR packs the kind of off-road equipment expected of today’s Range Rovers. Permanent 4-wheel drive is joined with a center differential and 2-speed transfer case, both with electronic controls. Other tech aids include hill-descent control and “Terrain Response 2” with “General,” “Dynamic,” “Grass/Gravel/Snow,” “Mud/Ruts,” “Sand,” and “Rock Crawl” settings, plus an “Auto” setting that will select for the driver. 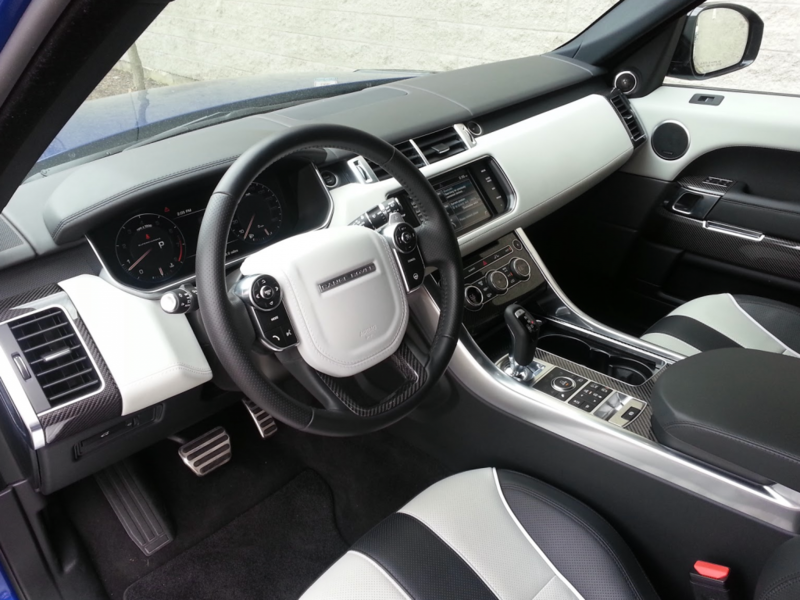 The buttons and dial for these features take up a lot of real estate on the broad center console, but at least they prevent Land Rover from putting in some overly complicated remote control for the infotainment system. In general, driving and convenience controls are easy to read and access. Rear passengers have access to seat-heat controls on the back of the center console. Interior execution, in terms of materials and assembly, is impeccable. Cushy-to-the-touch materials covered the majority of the dash and door panels in the example that CGers drove, and optional carbon-fiber highlights were liberally presented throughout the cabin. The SVR comes with front sport seats that have adjustable bolstering for better grip in aggressive driving situations, but this driver found the seat back to be very stiff and not particularly comfortable. This 5-10½ tester had all the leg room he needed, but that probably came at the expense of some rear-seat leg room, which isn’t all that generous. Three adults can fit across the rear seat, and both outboard positions recline. Head room is good throughout. It’s fairly easy to see out of the Range Rover Sport, but step-in height is a reach for shorter passengers, and exiting the rear can require a bit of choreography. The space for what passengers bring along starts with a big glove box but a not-so-big console box—some of its space given over to USB and power-point inputs. There are covered cup holders in the console and front-door pockets. Rear doors have pockets that are essentially bottle holders. In back, a central arm rest pulls down to expose 2 cup holders and a small net pouch. Land Rover makes it hard to forget that this is an SVR edition. Cargo loads onto a flat floor. Capacity is OK but not outstanding; perhaps weekender luggage for 4 or a family’s groceries will fill the space. Chrome tie-down hooks are provided, and rear seats split 60/40 to extend the cargo room. The SVR starts at an eye-opening $110,475. To the existing key Range Rover Sport standards like Terrain Response 2, the 4-wheel drive, dual-zone climate control, power tailgate, panoramic sunroof, navigation, and Bluetooth connectivity, the SVR adds the enhanced engine, active exhaust, 21-inch wheels, rear spoiler, distinct styling and aero enhancements, and front and rear heated seats among other things. You don’t have to stop there, either: The one CG drove hit $126,360 with options and delivery. How do you justify that kind of expense? Well, you could look at it that instead of buying a high-performance car, a luxury sedan, and an SUV separately you got them all in one. At least from that perspective, those are monster savings. 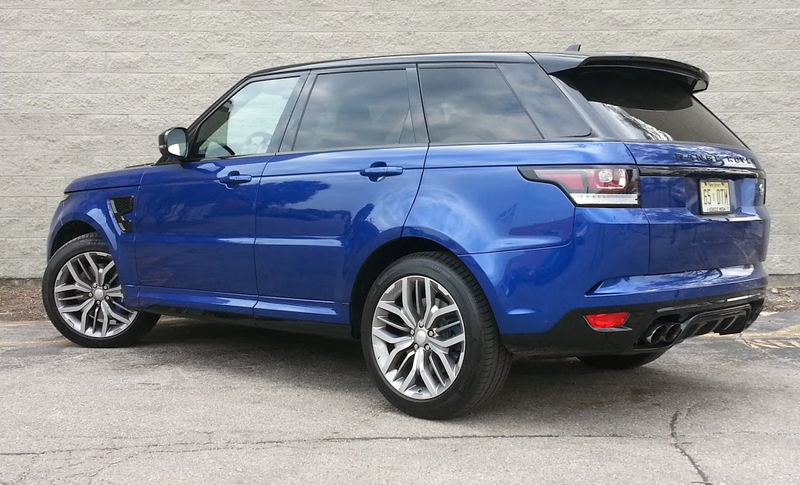 The contrasting black roof on Consumer Guide’s test SVR adds $650 to the bottom line. Written by: The Daily Drive staff on November 4, 2015.on March 26, 2019.